Jewish scholars related the 'neck' to the Temple location in Jerusalem. King Solomon's Song of Songs (4:4) translated from its Hebrew origin to: "Your neck is the tower of David, built as an ornament." Rabbi Chaim Vital, a student of 15th century Rabbi, Yitzchak Luria, known as The Ari quoted this verse to explain the secret meaning of Exodus 12:40 which describes the children of Israel as they left exile; "And the dwelling of the Israelite's in Egypt was 430 years." Rabbi Vital attributes five disciplines that distinguish God from His inconceivable state to His state in nature. Rabbi Vital explains that God's name "Elo(h)im", which connotes restraint or discipline represents His natural manifestation. Because Hebrew letters are also numbers, the value of this name equals 86. Rabbi Vital brings this together by multiplying the 5 states of restraint by 86, which equals 430. Moreover, 86, God's constricted state numerically equates with the Hebrew word - 'hateva' meaning "The Natural." A few lines after Song of Songs relates the tower of David to 'the neck', the following line appears; "I have come into My garden, My sister, My bride". Rabbi Menachem Schneerson known as - The Rebbe, drew inspiration from this for his inaugural recital of Basi LeGani, the last work by his father-in-law before his death. A year later, The Rebbe presented his recital of the work on his acceptance and transition to the seventh and final Rebbe of Lubavitch. Basi LeGani describes the brilliance of release from exile relating its realization to the Temple in which God's name, in His ultimate 'inconceivable' state, is exclusively revealed. The neck is the body's constricted conduit between the head and the heart. At the front it houses, vessels for speech, nourishment, blood and breath (known as Joseph), at the rear the protective spine feeds brain signals to the heart and body (known as Pharaoh). In the time it takes for a signal to pass from heart through neck to brain, Jewish mystics suggest the expression of emotion to thought to physical action is exposed to potential disruption. Overcoming this potential shortcoming is a free choice, moreover it is a choice in which one's state-of-mind is critical to the least disrupted outcome. In these verses, the Hebrew word used for the neck's ornament is 'talpiot', which is allegorically expressed by the sages as a contraction of two words that mean, "the heap (that was and will again be) beautiful" or "the mount (which and to which) all mouths (will) pray." The mystical interpretation of the adornment to the neck could fill many books, but I wish to focus here only on its related geo-physical implication. In Jerusalem's City of David there exists a 'heap' or 'mound,' the subject of much excavation over the past 30 years. Today, this heap is known as the 'tower' and it is built over Jerusalem's only perennial spring known as Gihon. Recent excavations revealed archaeological features so powerful they could literally rock the world. The findings contain bronze-age bedrock structures extensively used for sacrificial worship which were fortified and concealed to protect their sanctity. From these original structures the City of David and Jerusalem grew into the city it is today. At this excavation a small, single monument, a sliver of stone, remarkably (since no other like it in Israel has survived) remains standing after 3570 years. Supported in a frame of 12 stones, it marks the spot where Jacob slept on the night he was exiled, from Israel while fleeing his brother and the spot where he returned to accept his ultimate name Israel. Whilst this small stone is indeed monumental, its source (according to Midrash) was from stones of the adjacent altar ramp. This altar had been used well before Abraham offered his son Isaac, and that makes this location earth-shattering because, according to the scholarly works, yet contrary to all expectations, it would also mark the spot for Jerusalem's third and final Temple. Topographically, the exposed bedrock of Mount Moriah, this sacred mountain, visible in its entirety in the bronze-age, would have resembled a head and neck when viewed from the southern approach. Additionally, the location of the tower or fortress of David's citadel would approximate the ornament adorning the neck. King David re-conquered this mountain on which Jebusites, with help from Israel's enemies had built a fortified city. From their he planned the first Temple, never knowing, realizing or revealing the true location of this altar. David's son, Solomon, eventually built the Temple on the head of Mount Moriah within the approximate boundaries of today's Temple Mount where the second temple was also built. If we pay attention to the preponderance of evidence from the Bible's exegesis, the location of the tower of David as the neck's ornament marks "the heap (that was and will again be) beautiful" or "the mount (which and to which) all mouths pray", yet this is the site which King David denied us when determining his temple plans. Reconstructing the evidence, it is likely that, ~200 years after King David, King Hezekiah realized what David had done. 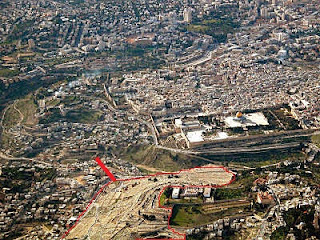 He would have discovered this while diverting the water of the Gihon, extending the city walls, and he built around the tower of David to mark, protect and hide this holy site for future generations. In doing so, his grief almost killed him, miraculously he was granted another 15 years. The shocking archaeological revelations at this location may be a significant catalyst to change the status quo and existing states of mind just as The Rebbe rescued orthodox Judaism from its post holocaust demise. As such it presents enormous difficulties and challenges especially among religious Jews who are likely to dismiss this revelation reverting to their customary orthodox interpretations of the Temple's location. In many ways our realization of the rectified state-of-mind and its expression is the final redemption in which we all accept that knowledge constitutes a completion of our exiled state. Mystics and scholars of the Hebrew Torah who left a trail of clues did so to promote this rectified state of exile emphasizing the holistic perspective: A world devoid of happenstance where every occurrence has its Divine purpose. Their writings stare in Israel's face, unequivocally declaring its sole and exclusive, indigenous right to the garden, the land of its people. Other than for momentary abandonment's through exile since the time of Joshua, more than 3000 years ago Jerusalem has been kept by Jews. Now Israel and its leaders must boldly pursue its inherent, often unexpected wisdom to dismiss with conviction foreign leaders who demand Israel's exiled state continues. Now is the time to finally take its rightful place as the nation by whom other nations are inspired and to complete the glorious mission to build God's House started by Jacob so many years ago.